What Makes Little Spoon Different? How Easy Is Little Spoon To Follow? Little Spoon is a California-based company that offers ready-to-eat cold-pressed baby food blends that are specifically optimized for the needs of babies and toddlers. The products from this company are made from over 80 organic ingredients, including blueberries, carrots, chia seeds, chickpeas, and avocado. All of the baby food comes in BPA-free containers, with resealable lids as well as ergonomically designed spoons that are perfect for your little ones. As a parent, you need to make important decisions that will affect their lives every second of the day. A major part of this is to take care of your child’s nutritional needs. This can be a pretty big challenge, especially when the child is too young to vocalize what they need and want. Just remember, it doesn’t get any easier when they get older. There are a lot of things to learn about what your child needs to eat at every stage of their development. This is a struggle that many parents have to deal with on a daily basis. Little Spoon is a meal delivery service that was created to ease your dinner struggles by providing parents with providing fresh, organic blends of food that are exact what your child needs to have a balanced and healthy diet. Your growing child has very specific nutritional and developmental needs, which is why Little Spoon works together with a team of experts who have a lot of experience in feeding babies and toddlers. This team of professionals include a pediatrician, registered dietician, certified dietician nutritionist, and a professor of pediatrics. This company was created out of the frustrations of a new working mom, who was struggling to do everything right. She was inspired to create a company that would help other working families who wanted to make sure that their children get the best quality food. Little Spoon will send out biweekly shipments of highly nutrition purees that are both USDA Organic Certified and non-GMO Project Verified. The food is made through the use of high-pressure pasteurization that is necessary to retain nutrients. The lineup of food options consists of single-ingredient purees, multi-ingredient blends, and combinations that are a little bit chunkier made from grains and superfoods. Every container of food is individually packaged with the perfect sized spoon for feeding your child. As a customer, you are able to make a meal plan tailored to your kid’s favorite flavor and age. You are also able to pause, change, or cancel your food delivery at any time. This is a review of Little Spoon, one that offers you all of the information that you need to decide if this program is one that will work for your family. This is a new meal delivery service that could be the perfect solution for your family. Keep reading our honest Little Spoon review to learn more. The first thing that you probably want to know is “Who Little Spoon is made for?” Little Spoon is made for any parents who have babies and toddlers who want to ensure that they have healthy foods. This is a program that is perfect for people who are too busy to shop for quality ingredients and prep food. This program is also perfect for people who are looking for a fresh and much healthier alternative to frozen meals. When you decide that you want to subscribe to Little Spoon, you will be asked to fill out a questionnaire that was made to help their team learn about your child. The information that you will provide includes your child’s name and birth date. It also includes the nutritional preferences that your child has. Then you will be asked if your child eats pureed food, finger food, a combination, or not even eating solid foods yet. You will be asked if you make your own purees or if you buy baby food at the store. From there, you will need to detail your child’s eating style. Are they very picky or are they more adventurous? Be sure that you mention any food allergies or if you want your blends to include meat. Once you have completed the questionnaire, you can decide how many blends you want to order for each day. You are able to choose the blends that you want to feed your child during the week. The deliveries are made every other week and will include enough blends for two weeks. What is great about this is that there’s no subscription minimum. You can skip deliveries, change your subscription plan, or cancel your subscription whenever you want to. Even better, there is a satisfaction guarantee on every blend that you get. What makes Little Spoon different than any other blend that you can purchase? The answer is quality. It can be hard to find really good, high-quality baby food. There are quite a few things wrong with store-bought baby food. These items are highly processed, contains a lot of sugar and preservatives, and may even sit on the shelf for longer than it should. You could choose the more convenient pouches, but these are not great options for the overall development of your child. Pouches do not offer the same development of oral muscles and prevent your child from being able to smell, see, and touch their baby food. Homemade baby food is always a great choice, but the problem is that not everyone has the time to make food for their baby every day. Thanks to Little Spoon, you can get fresh food blends that are made of organic ingredients that contain nutrients that are essential to your child’s development especially during the first years of their life. The blends from this company do not use any artificial products nor do they contain preservatives or additives. Through a technique known as “high-pressure processing”, they are able to eliminate the presence of harmful bacteria while also preserving the nutritional value of these blends. 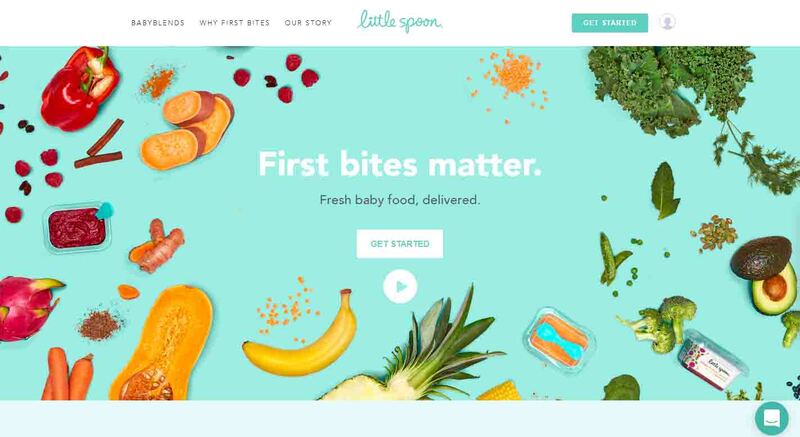 Little Spoon is a name that reflects one of the main goals of the company: allowing babies to learn how to chew and get used to the different food textures. It is important to teach your child how to eat with a spoon, as this can reduce the risk of choking. It can support the healthy development of muscles and motor skills. Every blend is not only created with the different developmental stages of each child in mind, but every box that Little Spoon sends out is customized to meet the needs of your individual child. Unfortunately, this company is unable to provide food blends for children who have a severe food allergy. However, the blends are made in an allergen-friendly environment. This makes them suitable for children who have mild food allergies. If you are concerned about this, you should speak to your pediatrician before deciding on Little Spoon meals for your child. The blends come in a PET plastic container, with a PP plastic spoon as well. Everything is BPA-free, making these items very safe for your child. The containers and spoons are 100% recyclable, making them healthy and environmentally conscious. There are new items that are regularly added to allow children to get the benefits of new ingredients while also experiencing new flavors. Because of Little Spoon, parents now have the opportunity to provide children with only the healthiest food that was made to meet their individual needs. Nutritious food is absolutely necessary to facilitate the healthy development of your child’s body, including their brain and central nervous system. The prices are reasonable, especially considering the quality organic products that are used to craft these healthy blends. The experts at this company are passionate about offering quality products that meet the nutritional needs of children. The early years of a child’s development is among the most important. This is where they do most of their growing. This is where you can start getting them into healthy habits that they will carry with them throughout the rest of their lives. This is a crucial time in your child’s lives which is why it is important to be picky about the food that they eat. Little Spoon is made for children who are 12 months old or older. Every ingredient in these blends are chosen for a reason. These ingredients are made to support the digestive system, contribute to developing healthy bones, and promotes detoxification. These blends also have anti-viral and anti-inflammatory properties to promote the health of your child. The blends from Little Spoon are fresh and made to order. The food is certified USDA organic, non-GMO project verified, and lacks additives and preservatives. The plans are customized for each individual child, because every child is different and has different nutritional needs. Some children are picky and won’t eat anything great while others may love to try new things. The blends are planned out to optimize your child’s development and the nutrition needs at their milestones. You can customize a plan or have a meal plan picked out for your child. Or you could easily tweak the meal plan in place. You have enough to worry about every day, which is why Little Spoon makes meal time a little less stressful for parents. You want your child to have the best quality and highly nutritious food and Little Spoon offers this in a convenient manner for you. The price isn’t based on each individual blend, rather you pay based on how many blends you order. The more blends that you order every day, the less each individual blend costs. For instance, only 1 blend a day will cost you around $3.92 per blend while 3 blends a day only cost $2.97. There are no extra costs to you and shipping is free on all orders. When this company was first launched, delivery was limited to select locations. There were waiting lists for customers who were anxiously awaiting these items. As this company became more popular, they gained the ability to deliver products across the continental United States. Delivery is still unavailable in Hawaii and Alaska. If you need additional help you can check out their informative FAQ page or contact them by email, or call the phone number. Should you get Little Spoon for your child? Here is a recap of the pros and cons of this service. Team of pediatricians, nutritionists, and other experts helped create blends. Ingredients are carefully selected to support your child’s development. Your box is designed specifically to meet the needs of your child. Can make adjustments, such as no meat in the blends based on diet. May be more expensive than store-bought food. As you can see, the clear choice here is investing in the health of your children by investing in Little Spoon. The nutritional habits that you start your kid on today will carry on with them in the future, giving them the best chance at a healthier lifestyle. Little Spoon has a passion for making fresh baby food with only certified organic and non-GMO ingredients without all of those preservatives and additives that you want to avoid. Best of all, it’s delivered directly to your doorstep. It is important to Little Spoon that only wholesome ingredients are used, creating food that is specifically designed for your sweet child. The food is fresh, made-to-order, arriving on time and deliciously healthy. Your child deserves only the best and Little Spoon delivers. Little Spoon understands how important it is to start your children off right with a healthy diet, but how difficult it can be to ensure they have the healthiest food. Little Spoon is here to help you. Switching Plans: Skipping one or more deliveries is easy! Simply log into your Little Spoon Account and click on the "Delivery Schedule" tab. From there, you can Skip, Unskip or Shift future deliveries. The cutoff time for changes to your delivery for the upcoming week is 2:00p EST the Saturday before delivery. Little Spoon has pros and cons that you need to consider. While it may be more expensive than some store brand options, you are getting a higher quality product for your child. Ultimately, you need to consider the needs of your family and your child to decide if Little Spoon is the right choice for your family. Food is fresh and made to order. The meals arrived at your house on time, in cute packaging and, most important, fresh. Offer customized meal plans for babies helping to optimize their development by giving them the cleanest. Certified USDA organic, non-GMO project verified and do not include any preservatives or additives in the food. We found 7 verified Little Spoon Discounts, Coupons and Promo Codes for Feb. 2019. If some of the Little Spoon coupon codes have expired, please contact us, thank you for your help. 30% OffGet 30% off any order with promo code! 25% OffGet 25% off Subscription Plans with promo code! 20% OffGet 20% off Organic Baking DIY Kits with promo code! 15% OffGet 15% off any order for New Customers with promo code! $20 OffGet $20 off 3-Kit Organic Baking Kit Subscription with coupon code! $10 OffGet $10 off with coupon code! $2 OffGet $2 off All Foodstris Mix with coupon code! If you like Little Spoon but aren't sure whether it's the best ideal choice for you, and may want to compare Little Spoon with other Companies' Plans, Products, and Services that similar to Little Spoon, or Little Spoon Alternatives and Little Spoon Competitors, Which companies' services like Little Spoon. You can take a look at our professional comparisons below to discover if one of them is more suitable for you.